Browse our store to find the perfect Celtic cross necklace. All our Celtic Cross pendants are handmade in Ireland & hallmarked at the Irish Assay Office Dublin Castle. Mr. Cunningham, I would like to express my appreciation for prompt delivery of a beautiful St. Martin’s Cross of Iona. To workmanship is extraordinary and it’s loveliness will last a lifetime. This cross has a special meaning for me. I wear it in memory of my parents. A special “Thank you” to all to everyone involved. I definitely will be ordering from Celtic Cross again. I received my package in the mail today. 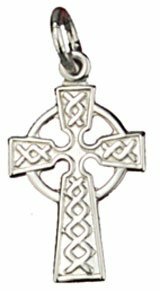 I ordered the Sterling Silver Heavy Celtic Cross S4091. I wanted to let you know how pleased I am with my purchase. The cross is beautiful. I know my son will be very pleased. This is a gift for his confirmation. I learned about your company from my nephew who has the same cross. I will be sure to let my family and friends know about Celtic Cross Online. The service is exceptional. I also wanted to mention that the gentleman I spoke to on the phone was very friendly and helpful. We will sent you three or four emails per year featuring Celtic Cross special offers, promotions and gift ideas.